Currently, it’s the entertainment world that’s making the biggest strides in virtual reality. Devices like Oculus Rift and PlayStation VR are focused on making video games feel more real and immersive than ever, but other industries are starting to realise that they too can use the technology to boost sales and engage consumers. Retail is one such industry. Online shopping is now more popular than ever, but it’s a passive experience – VR is changing that. Here’s a look into how VR is already impacting retail experiences, and what consumers can look forward to seeing in the future. Imagine you lived in Japan but wanted to visit London’s Selfridges store. Yes, you can go to the store’s site and make purchases online, but it’s not the same as visiting the iconic shop in person; being able to see every product up close. With virtual reality, though, this is possible. No matter where you are in the world, you could potentially visit any store, at any time of day, from your living room. This opens up a whole host of selling opportunities to retailers – they no longer have to build stores in every city or every country, as anyone from anywhere can visit virtually, and then order the things they liked online. Moreover, ecommerce businesses with no physical stores at all can create their own virtual ones. This example from Kinect for Windows shows how a clothing store might look in the virtual world, and how customers can interact with it. 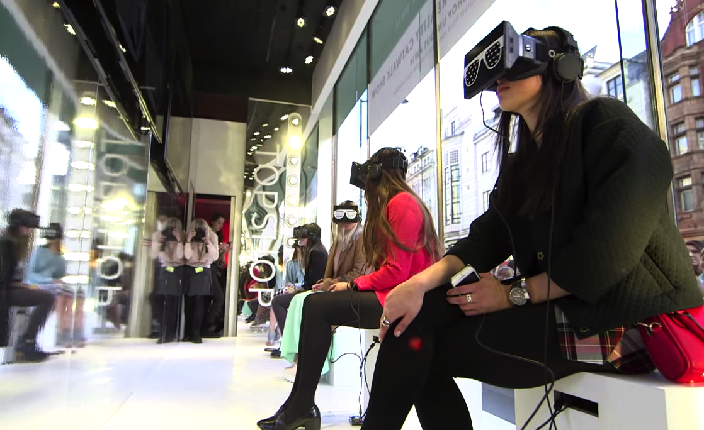 VR makes almost anything possible – you can take consumers anywhere, not just to your store. American retailer Toms, which utilises one-to-one marketing, decided to bring VR into a select number of shops. Buying a pair of shoes from Toms means that another is given to a less fortunate child elsewhere. Although the brand showed images and videos of how the business was changing people’s lives, the number one request from customers was to actually be able to visit these children. Using VR, Toms was able to provide this experience to its customers. People visited the store, put on a headset and were instantly transported to Peru. This type of brand storytelling is a great way to engage customers in a completely new way. If customers can experience the difference they’re making up close, it’s going to have a much bigger impact on future sales than if they were to watch a video. For many retailers, creating such experiences may be out of the question at the moment – the four-minute Oculus Rift film produced for Toms cost $250,000 (around £164,000) to make, and $1,000 (£656) was spent on each headset. 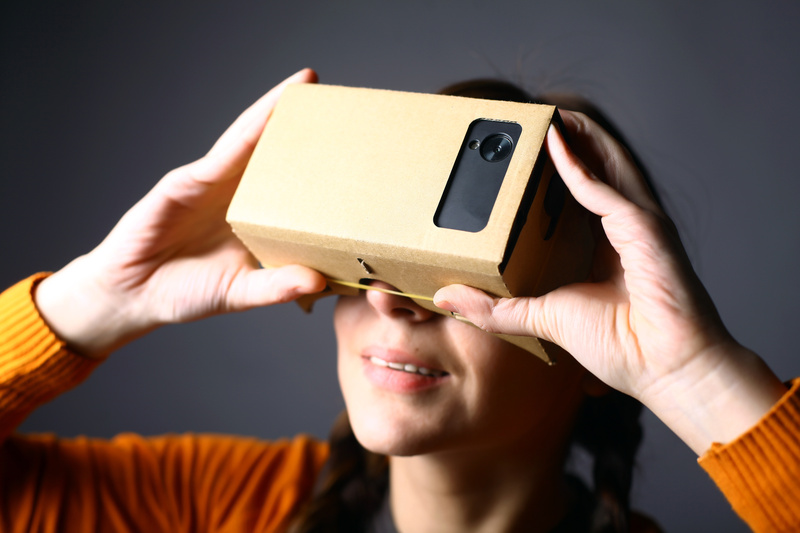 However, innovations like the Google Cardboard Virtual Reality Kit are making VR much more accessible and affordable. All you need is some cardboard and a smartphone! Allowing consumers to handle high-value products like jewellery, art and furniture is always risky – what if they drop a £2,000 watch or scratch a £20,000 work of art? How about moving goods? Transporting large items such as cars to trade shows might not always be possible, yet you still want consumers to be able to see and handle these products up close. Using VR, consumers can try on that watch or see what that piece of art looks like in their living room instantly. They can get in that new model of car you’re creating and even take it for a test drive right there on the showroom floor. VR allows you to easily achieve what you wouldn’t be able to orchestrate in real life. 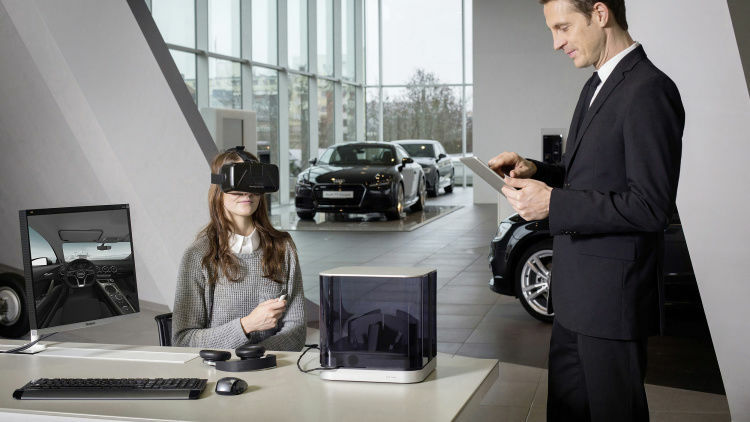 VR isn’t all about improving customer service, it can be used in a much more corporate sense as well. To improve the overall shopping experience, retailers are always playing around with store layouts. However, planning how to change a store’s appearance or layout is a costly, time-consuming process, and it’s difficult to visualise what the shop will actually look like just from an artist’s impression. VR could save retailers a lot of time and money, and make consumer’s experiences better, by showing store owners what their shop could potentially look like before a brick is laid or paint is purchased. Retailers could even play around with the layout whilst stood in the virtual store. Mystery shoppers could then test the new layout to see if it works in a ‘real world’ situation, without having to travel to the actual store. Imagination is the only limit when it comes to VR, making it a really exciting technology for retailers. Whilst its use may not be widespread now, brands like Toms are adopting it to ensure they get ahead of the competition and give themselves a competitive advantage. Retailers of all sizes need to get to grips with the technology now if they don’t want to get left behind. If you'd like to learn more about VR and the experiences we've created, check out some of our work, drop us a line here, or call 023 8184 811 to talk to us direct.